This past weekend was a busy combination of activities. Some I enjoyed (long runs, buying running clothes, swimming) and others I didn't enjoy at all (an all day reception on Saturday). In between that I spent a few hours organizing my workout storage area consolidating everything into a wooden wardrobe in the guest room. I placed my running sweats, compression tights, thermal wicking jerseys, winter head gear and gloves into their own section and created new spaces for summer jerseys, running shorts, socks, etc. Now I no longer have to bounce back and forth between the bedroom, cabinets and baskets to collect my gear for a morning workout. I'm hoping this better organized setup will shave off a couple of minutes of prep time for me in the morning. Every minute counts. As I was doing this task it occurred to me that I still have drawers filled with clothes that no longer fit me. Over the past few weeks I'd transferred some suits into the donation bin but I still had dozens of tee shirts, polo shirts and dress shirts that now look huge on me. I've recently bought some new casual clothes so it was easy to let go of most of the tees. I drew the line at my MIT shirts since they are special and many still fit. There were some items that had me on the fence like long sleeve comfortable jerseys. I had to fight the urge to retain them but out they went. The purge continued with pants and shorts and by the end I must have had 50 lbs. 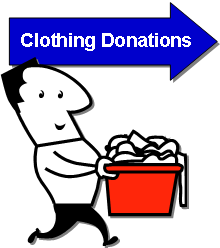 of clothing ready for donation. All the while I was throwing clothes into the donation basket I wondered if this was a fool's errand. What made me think I would continue to remain the size I am now? What if I gained 5 or 10 lbs? I decided that I had to press on as I fully intend to remain focused on fitness and running. I lost my weight quickly but I did that through a sustainable program of portion, sugar and (bad) fat reduction. I don't starve and running keeps my weight in balance. I could always buy bigger clothes if that became necessary but my dislike for shopping for (non-exercise related) clothing is so intense that it may be enough to keep my diet in check. After all my dreading of the treadmill I did get on it this morning for a quick couple of miles. I started off at a comfortable pace and increased it periodically until finishing the last two minutes under an 8:00 pace. I ended up running 8:32/mi overall. It was fine but I miss the street. AG lent me a head lamp and reflector vest from her relay team supplies so I'm planning to try that as an occasional alternative to the weekday treadmill events. Adventure Girl Needs Your Help!